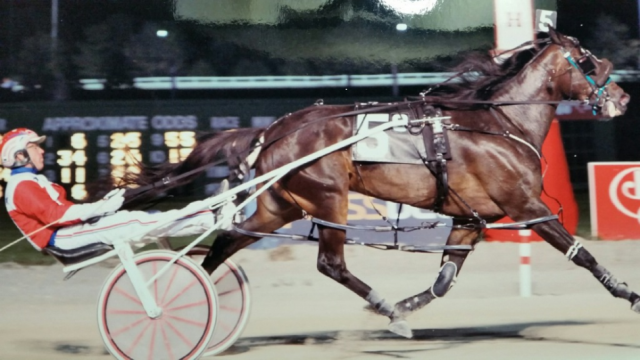 Trotting Grace, foaled and raised at the University of Illinois and sold in the UI 2016 yearling consignment to the Illini Classic Sale, dominated her 3 year old trotting peers at the Illinois State Fair on August 11th and 15th. Trotting Grace set consecutive personal-best win records, while pushing her lifetime earnings to over $102,000. The best Illinois-bred 3 YO fillies assembled on August 11th for the $6,000 Illinois State Fair Stakes Elimination for Illinois conceived and foaled (ICF) trotters, and 10 trotting fillies lined up behind the starting gate for race #1 of the Illinois State Fair. As the gate folded, Trotting Grace’s stablemate, Maui Momma, wasted no time in getting the announcer’s call into the first turn, and maintained the top position to the quarter mile marker in 28.3 seconds. Trotting Grace settled into 4th in the first turn and stayed there past the quarter until Driver Kyle Husted sensed the outer flow advancing to his filly. In danger of being trapped on the rail, Husted pulled Trotting Grace from 4th and exploded past the top three trotters to quickly take the lead past the half mile marker in 58.1 seconds. Trotting Grace continued to trot effortlessly past the ¾ mile station, and extended her lead to 3 lengths in a time of 1:27.2. At this point, the only question was how much the margin of victory might be for Trotting Grace. While Husted glanced back to the field, the only contender appeared to be Trotting Grace’s stablemate Maui Momma who was making no headway toward catching the leader, and the rest of the field struggled to keep up with the powerful Trotting Grace. Down the stretch, Trotting Grace extended her lead with every stride while under no urging at all. As Kyle Husted sat quietly in the sulky, Trotting Grace glided under the finish wire with 4 ¾ lengths to spare in front of Maui Momma in a new lifetime record of 1:54.4. In the $25,000 Illinois State Fair Championship Final for ICF 3 YO Trotting Fillies on August 15th, carded as race # 9, Trotting Grace took no chance of encountering traffic trouble, as she blasted from the gate at the beginning of the mile and never looked back. 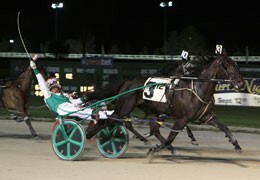 The result of her effort was another dominating win in another new lifetime mark of 1:54.2. Despite getting perfect trips behind the powerful winner, White Pants Fever and the rest of the field could only watch helplessly as Trotting Grace once again opened up huge margins on her competitors and then coasted home without urging to a 5 ¼ length score over White Pants Fever and Maui Momma. Trotting Grace is owned by Bill Wright and Mystical Marker Farm, and Trainer Steve Searle. Trotting Grace is sired by the University of Illinois stallion Cassis, and out of the UI-owned broodmare Maevey Gravy. Maevey Gravy was the ICF Champion Trotting Filly of the Year during her 3 YO campaign, with a record of T, 3, 1:55 ($190,110). Trotting Grace is the first foal of Maevey Gravy, and the UI Horse Farm looks forward to the exploits of future offspring of Maevey Gravy. For the second straight year, The University of Illinois Horse Farm is home to an Illinois Stallion of the Year, as recognized by voters in the United State Trotting Association’s District 5. At the January 2017 USTA District 5 Awards banquet, The UI pacing stallion, Sagebrush, was named Illinois Pacing Sire of the year for 2016, and now his diagonally-gaited stable mate, Cassis, has matched his honor by being named the 2017 Illinois Trotting Stallion of the Year at the 2018 USTA District 5 banquet held on January 20th in Springfield, IL. Cassis, owned by the Cassis Syndicate and primary shareholder and Syndicate Manager Carl Becker, and standing stud at the University of Illinois since the beginning of his career, set the standard for Illinois trotting stallions in 2017 primarily on the strength of siring numerous stakes-winning 2 year olds. His top 2 year old stakes-winners included Maui Mama 2, 1:56 ($ 81,280), Trotting Grace 2, 1:59 ($ 64,782), Illinimight 2, 2:00.1 ($ 84,330) and Cruzen Cassi 2, 2:01.3 ($ 59,256). Cassis also strengthened his credentials with strong performances from his 3 year old race horses like Anna’s Lucky Star 3, 1:53.3 ($ 190,300) and Trixie’s Jethro 3, 1:57 ($ 96,116). Maui Mama was named 2 Year Old Illinois Trotting Filly of the Year, and Anna’s Lucky Star was named 3 Year Old Illinois Trotting Filly of the Year. The University of Illinois Horse Farm continues to stand Cassis for a 2018 stud fee of $2,500 and the pacing stallions Sagebrush and Major Bombay for stud fees of $2,000 each. A pair of University of Illinois-owned fillies that were sold in the 2016 UI consignment to the Illini Classic Sale proved to be bargains for their new owners in 2017. Rollin Coal P, 2, 1:56.1 ($90,729), the incredibly consistent Sagebrush daughter out of the University of Illinois-owned broodmare Emission Control P, 2, 1:54.1 ($19,597) raced near the top of her class all season long after being purchased by Hosea Williams for just $3,600. Rollin Coal started her career with 3 straight wins at Hawthorne Raceway in the first leg of the Incredible Tillie Stakes and the elimination and final of the Violet Stakes. After one sub-par effort in a two year old filly overnight pace when she finished 4th, Rollin Coal never again finished off-the-board in the remainder of her stakes races. In 3 more legs of the Incredible Tillie Series, Rollin Coal placed third once and second twice, then was second in the $175,000 Incredible Tillie Final to eventual 2 YO filly Pacer of the Year Fox Valley Jazzy P, 2, 1:54.3 ($130,265). Rollin Coal finished the 2017 season with 2 straight wins in a pair of Fall Review Stakes at Springfield. Rollin Coal was the second-richest 2017 Illinois 2 Year Old Pacing Filly, and was also the 3rd fastest race-timed filly when her furious rally from 5 lengths back at the ¾ pole in the Illinois State Fair Championship ended with her finishing a close 3rd , beaten just 1 ¾ lengths in 1:53.3. Hosea Williams has good reason to believe that Rollin Coal can race at the top of her class in the 2018 Illinois Sires Stakes. 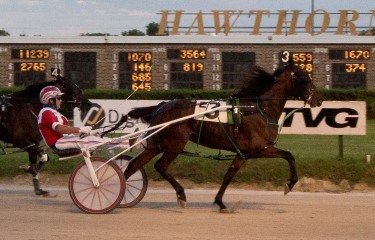 Trotting Grace, T, 2, 1:59 ($64,782) was purchased by H.W. Wright from the UI consignment to the Illini Classic Sale for just $5,700, and she was also near the top her division all season long. She had 5 wins, 2 seconds and 1 third out of 10 starts – all in stakes races. Her only off-the-board finishes happed when she finished 5th in the Violet Stakes final after suffering an entrapped epiglottis, and in the Shawnee Stakes at DuQuoin, being placed 5th in a heartbreaking loss due to interference with another horse after finishing first by 7 lengths in a sparkling 1:56.3. Trotting Grace showed extreme 2 year old trotting speed in the State Fair Final as well, trotting in 1:57 after a very tough journey left her in 3rd place. Mr. Wright has plans to race Trotting Grace against the top Illinois stakes fillies in 2018, as well as top regional foes in surrounding states this upcoming year. The University of Illinois stallion Sagebrush, P, 1:49 ($646,967) was named Illinois Pacing Stallion of the Year during the USTA District 5 meeting held Jan. 21, 2017 at the State Fairgrounds in Springfield, IL. The regally-bred son of Western Hanover, out of the 100% producing Abercrombie daughter Just Say Go P, 3, 1:54.3 ($93,840) “outpaced” his fellow Illinois stallions in 2016 on the strength of an outstanding crop of 2 year-olds that included Illinois Horse of the Year, Princess Sage P, 2, 1:53.3 ($90,527), as well as other freshmen standouts like Artemesia P, 2, 1:53.2 ($26,585), Razzleme Dazzleme P, 2, 1:54.4 ($55,567), Slzburgerslzburger P, 2, 1:54.2 ($12,681), Spirited Encounter P, 2, 1:54.3 ($27,142), Dee Tumbleweed P, 2, 1:55 ($27,557) and Uptown Sleaze P, 2, 1:55 ($25,739). Sagebrush’s seven 1:55 two-year-old credits in 2016 led all Illinois Stallions by a wide margin. Keli Bell is a sophomore at Neoga High School who enjoys playing softball for the Indians and, in her spare time, riding horses with her sister, Katie. She also happens to own a harness horse which was recently named tops for all of Illinois. Princess Sage, a two-year-old pacing filly bred and co-owned by Bell, earned honors as 2016 Illinois Harness Horse of the Year by a vote of members of the United States Trotting Association residing in the Prairie State. The award was made official with a special presentation which took place Jan. 21 in Springfield. The Bell family offered a 50-percent interest in the filly to family friend Freddie Patton Jr. of Mississippi, with the condition that he would train the filly free of charge. Patton accepted, and he guided Princess Sage through a campaign of eight wins in 11 starts, with earnings of $90,000. The highlight of the season came Sept. 10, when the filly won the $100,000 final of the Incredible Tilly series at Hawthorne Racecourse in Stickney. Princess Sage earned a rest over the final two months of 2016, but she has since returned to training with the Midwest string of the Patton Stable at the DuQuoin State Fairgrounds. Defense of her Horse of the Year title will begin later this spring. The 2 YO pacing fillies raised and sold by the UI Horse Farm finished 1 -2, and daughters of UI Horse Farm Stallion Sagebrush finished 1-2-3 in the $35,000 Filly Pace Championship of the Illinois State Fair Colt Stakes on Wednesday, August 17th. Razzleme Dazzleme moved first-over just before the half-mile pole while brisk fractions of 26.3 and 54.4 were set by her stablemate San Antonio Rose. Razzleme Dazzleme continued to stalk the pace-setter while parked 2-wide; pulling within a half-length of San Antonio Rose at the ¾ pole in a time of 1:24. As Razzleme Dazzleme bore down on her barn mate through the stretch, a fresh Artemesia, who had followed Razzleme Dazzleme’s every move from the half-mile mark, tipped off cover and brushed past the game Razzleme Dazzleme in the shadow of the wire. Artemesia’s win came with a new lifetime mark of 1:53.2. The very brave Razzleme Dazzleme finished a half-length behind the winner and held second by a nose over a rapidly closing Dee Tumbleweed who claimed third ahead of the tiring San Antonio Rose. The win-place-show order of Artemesia, Razzleme Dazzleme and Dee Tumbleweed completed the “Sagebrush Trifecta”, as all 3 fillies on the tote board were daughters of the outstanding UI pacing stallion Sagebrush. Also of note was the fact that both Artemesia and Razzleme Dazzleme were trained by Rushville, IL Conditioner Nick Prather, who sent out 3 fillies in the Championship race, including San Antonio Rose. The University of Illinois Horse Farm invites all Illinois Standardbred Breeders to partner with us in the resurgence of the ICF program. While the horse racing landscape remains uncertain in the Land of Lincoln, the University of Illinois Horse Farm remains optimistic that the recent events in the industry will mark a resurgence of Illinois horse racing and breeding. The reduction and consolidation of harness racing dates into one major track, Hawthorne, along with increased purses during the spring through fall months could well be a positive development for Illinois racing and breeding, even without an immediate gaming bill. More opportunities for young ICF horses, especially trotters, are very likely – both for stake races and conditioned races that were not typically offered at the now closed Maywood and Balmoral Parks. The projected ICF stakes purses, probably very similar to those offered in 2015 in the absence of a gaming bill, still offer value to the small group of Illinois breeders that produce quality animals for our limited pool of ICF stakes-eligibles. A new gaming law could, of course, breathe new life into the ICF program and transform the breeding industry over night. The key to being a “big fish in the small pond” of the ICF program is to breed outstanding stakes horses in a limited stakes pool of animals that can then go on to be competitive in conditioned races in Illinois and throughout North America. We invite you to breed one or more of your good mares to one of our proven producing stallions that have displayed the ability to produce “the right kind” over and over. On the pacing side, for example, our stallion Sagebrush has posted some stunning numbers so far in his limited career. His offspring that are old enough to have raced at least through their 2 and 3 year old seasons number only 42 total foals. From that group, he has sired the likes of NJ’S Big Deal P 4, 1:50.1 M ($306,372); Sleazy Does It P 5, 1:51.3 M ($301,819); Thesleazyprincess P 3, 1:52.2 M ($280,298); Dee Dee Sage P 4, 1:52.0 M ($225,716) and Hostess Lisa P 4, 1:51.0 F ($212,266). Breeders have finally caught on to Sagebrush’s ability to sire top performers from many types of mares, and Sagebrush’s 2016 crop of 2 year olds is represented by a robust 47 foals – by far his biggest crop to date. Watch for them to make a lot of noise in the 2016 ICF stakes. Don’t overlook Duneside Perch either, as “all he has done for us lately” was to sire both of the 2015 winners of the two “glamor division” Super Night Stakes, the Orange and Blue and the Langley Memorial, in Dan D Dune P 2, 1:53.3 M ($120,626) and Dinky Dune P 3, 1:51.4 M ($85,975), respectively. His recent “out East” winners in PA and DE include Unlocked P, 4, 1:49.1F ($359,169); Duneside Chella P, 5, 1:51.4F ($94,172) and Beach Boy Brody P, 4, 1:52.1F ($77,337). On the trotting side, no one questions that Cassis has the most modern pedigree, and is the fastest trotting stallion ever to stand stud in Illinois. This Hambletonian heat-winning and multiple stakes-winning son of Cantab Hall has a first crop of 38 living foals that will be heard from this summer. Southwind Breeze, although overshadowed by his on-farm neighbor Cassis, has shown the type of siring consistency that most trotting stallions can only dream of. Southwind Breeze has sired winners all over the United States including Little Ms Chrissy, T 4, 1:53.4 ($248,688); Big Bill Breeze T 4, 1:54.1f ($169,986); Divination T 5, 1:54.4f ($127,176); Bailey’s Wish T 3, 1:55 ($223,035) and Bobby B Breeze T 4, 1:55.1f ($155,731). Fresh off a win in the Dudley Hanover Stake down in DuQuoin Dinky Dune continued his “dream season” as he rolled to a one-length victory in a career best of 1:51.4 giving driver Pat Curtin and trainer Dane May their first Super Night championships in the $112,000 Pete Langley Memorial for 3 YO colt and gelding pacers. Working out a second-over trip while Earndawg (Todd Warren) carved out splits of 28.0, 56.1 & 1:24.0 Curtin had the son of Duneside Perch—Dream Hand in perfect striking position as the field turned for home. Gradually reeling in a tiring Earndawg, Dinky Dune was well in hand to Curtin as he charged home in 27.2 to record his sixth win 14 starts this season. Earndawg turned in a game effort from the 10-hole to finish second while longshot Mighty Hot Shot (Ridge Warren) was third. The winner returned $7.80, $4.40 & $3.20 while upping his career earnings to $84,852. The richest event of the night was saved for last as a field of nine closed out the night in the $187,000 Orange & Blue Stake. Taking advantage of some brisk early fractions, Kay Willis’s Dan D Dune came flying through the stretch to win by a half-length in a career best of 1:53.3 for driver Mike Oosting. Pacing along third over while Royale Rose (Matt Krueger) faced constant pressure through splits of 26.4, 56.2 & 1:25.1 Oosting moved the Nelson Willis trained son of Duneside Perch—Witch Hanover three deep as the field hit the head of the stretch. Picking up one rival after another the Governor’s Cup winner zoomed right on by with a well measured move from Oosting for his fifth win of his career. Wondrous Sport (Casey Leonard) was a tough luck second while BS Tyrrific (Kyle Wilfong) was third. Ryleigh’s Lilly, the daughter of Western Hero and Fox Valley Chosen defeated a field of 10 older mare pacers in the $95,000 Lorna Propes Championship on Super Night, Saturday, September 12th at Balmoral Park. As she’s done so often this season John Barnard’s Ryleigh’s Lilly overpowered her rivals in the late going as she went sailing past them in the stretch to win by two-lengths in 1:52.4 for driver Casey Leonard. Confidently handled by her red-hot pilot the 5-year-old daughter of Western Hero was positioned in mid-pack while the lead changed hands several times through opening splits of 28.0, 55.4 & 1:24.2. Zooming by her rivals in the lane, Ryleigh’s Lilly was on cruise control through the final sixteenth of a mile as she reported home with her 19th career victory. Just By Design (Dale Hiteman) shook loose late to rally for the place money while Rev Me Up (Brian Carpenter) was third. The overwhelming 2-5 favorite returned $2.80, $2.40 & $2.10 while hiking her career bankroll up to $173,968. SUPER NITE WAS A SUPER NIGHT for the UNIVERSITY OF IL HORSE FARM STALLIONS! UNLOCKED -Winner of the $146,000 Langley Memorial by 11 1/2 lengths. SILVER DEVIL -Winner of the Maurello Cons. DUNESIDE PERTTIE -Winner of the filly Orange & Blue Cons. THE BIG SLEAZY -Winner of the colt Orange & Blue Cons. AL’S HAMMERED – Winner of the $112,000 Maurello Final, his third Super Nite win. UNCLE SI – Second in the Orange & Blue Cons. OVERLOADED – Second in Langley Cons. Thanks to all the breeders and owners for making this Super Nite happen. We’re looking forward to offering you the first crop by CASSIS 3,1:52.4, the Cantab Hall son that won the fastest elim. of his Hambletonian. See them at next year’s yearling sales.